However, there still exists the option in settings of iOS 9.3.5 on my iPhone 4s. Is it redundant? Is there any way at all to install an app in my iPhone from my MacBook Air? From web browser, iTunes or otherwise? You can browse the App Store on your Mac/Windows PC and install apps on your iOS devices by installing iTunes 12.6.3 with App Store support. More information and download links are available in the Apple Support article, Deploy apps in a business environment with iTunes. As far as the options shown in the screenshot are concerned, it enables automatic installation of apps purchased on other devices which are logged into with the same Apple ID as this device. 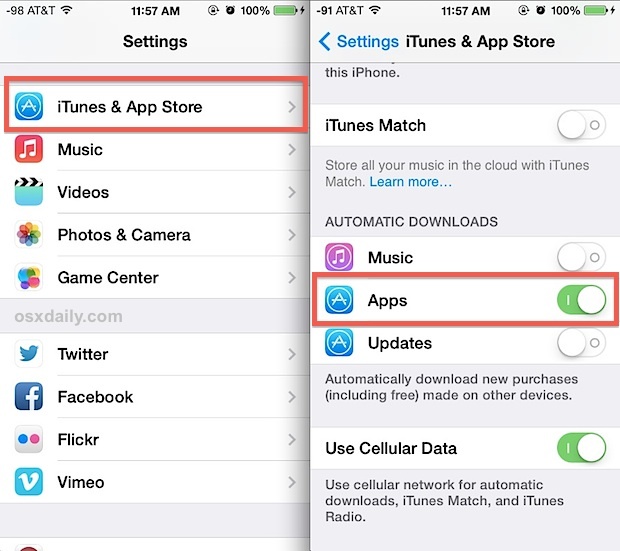 To further clarify, using the mentioned setting enabled, your iPhone will only download any new apps purchased either on any other iOS device linked with the same Apple ID or Mac/PC with iTunes 12.6.3 or older installed and logged in with the same Apple ID. It can't be used to install any previously purchased app not already installed on your iPhone. Installing iTunes 12.6.3 is the only resort for the time being if you wish to manually sync apps from your iTunes library. If you buy an app, it will automatically be downloaded on all the iOS devices, signed in with the same Apple ID that have that box checked. Not the answer you're looking for? Browse other questions tagged iphone ios itunes data-synchronization . How do I sync podcasts added in the iPhone's Podcasts app to iTunes on OS X? Can I get iTunes to stop updating a specific app?